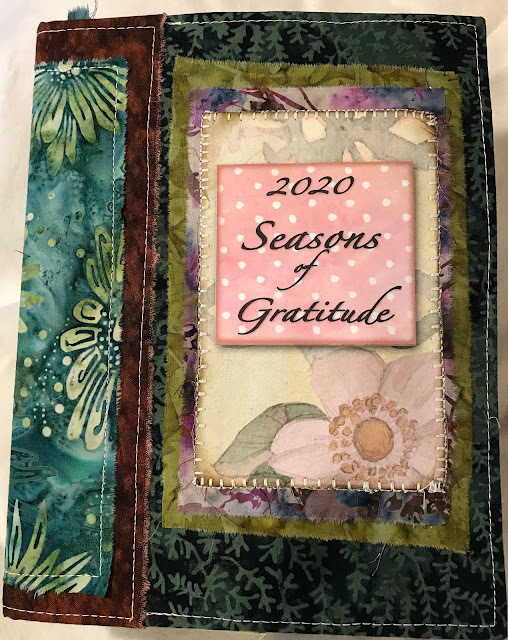 This little book was so much fun to create! 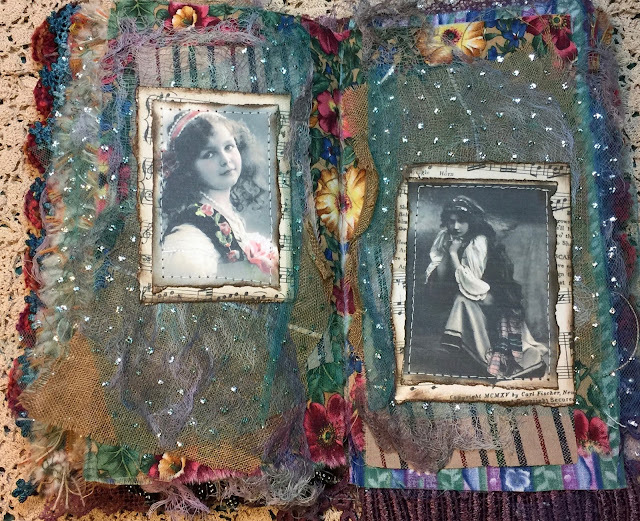 Just makes me feel good to look at the pages.... on sale in my Etsy shop HERE. Such a SWEET, SWEET book! 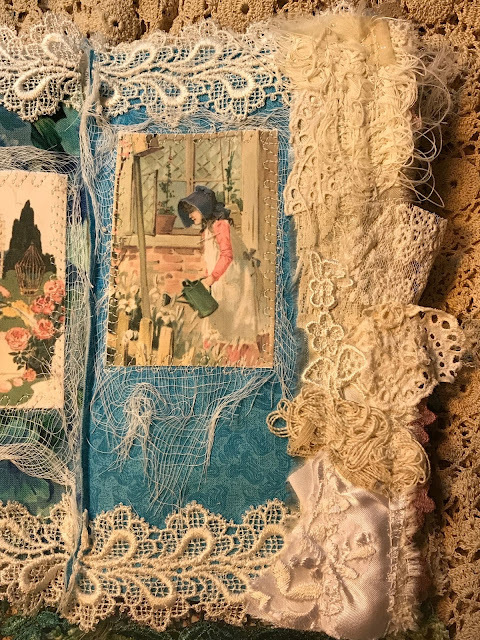 Sweet GIRLS in the GARDEN, Mixed Media Collage book, Lace Book, Fabric Collage Book, Garden Book, Fabric Book, Fabric Garden Book, Shabby guarantees to make you FEEL GOOD! Lots of journaling opportunities. 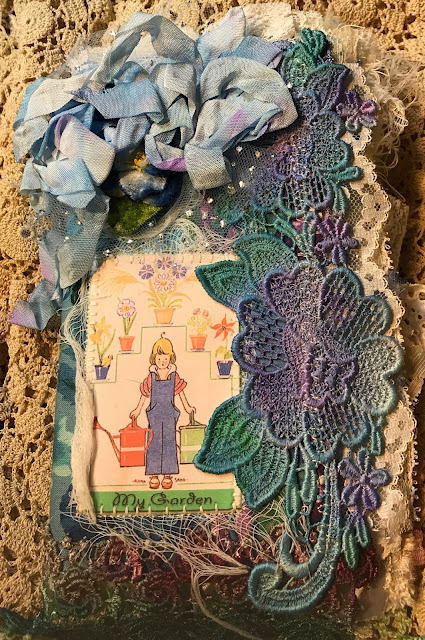 Every little tag you see has a lined journaling opportunity on it's back side! 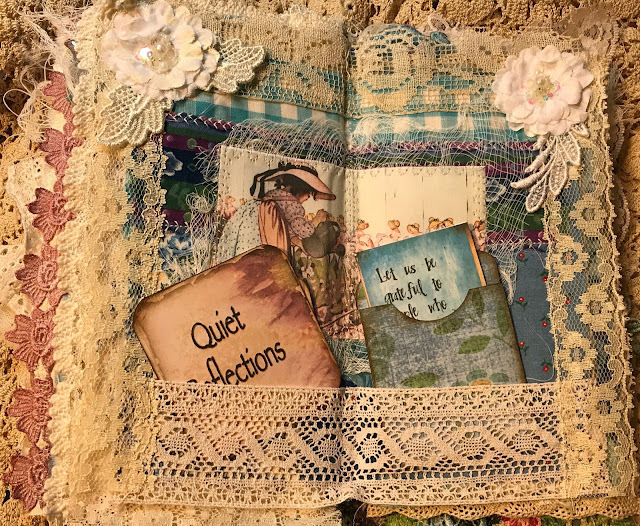 Includes a sweet mini journal for your thoughts. Book measures a wonderful 9x5 plus inches! 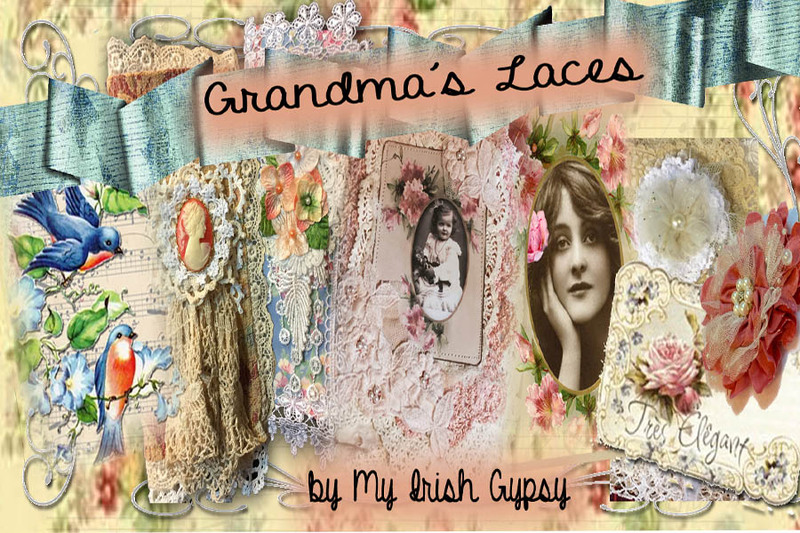 with oodles of laces slipping out all over!. 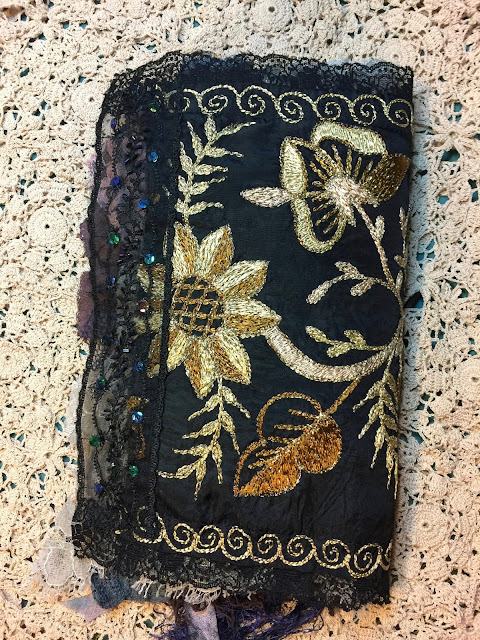 Lots of pockets too. Such fun! 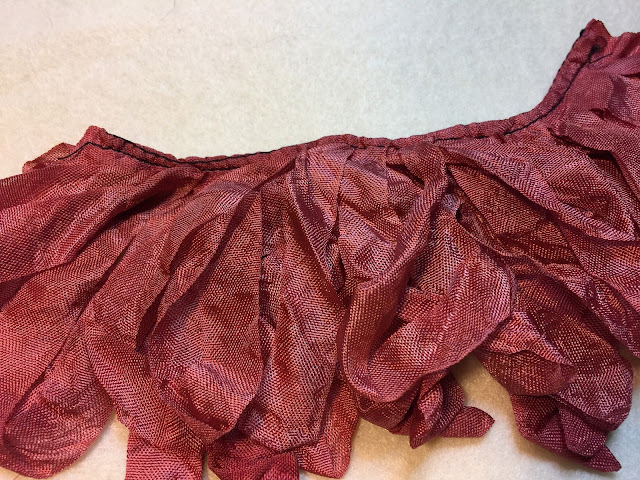 I finally figured out how to create crinkled, looped, seam binding, fringe! 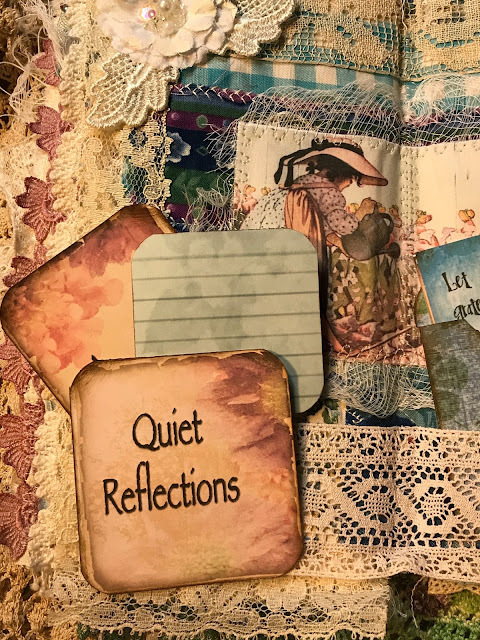 shhhhhh... the 'how to' tutorial will come! 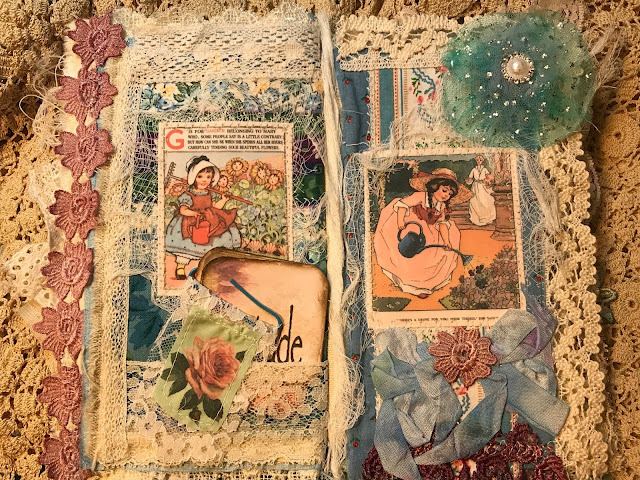 Ended up being so easy to do! 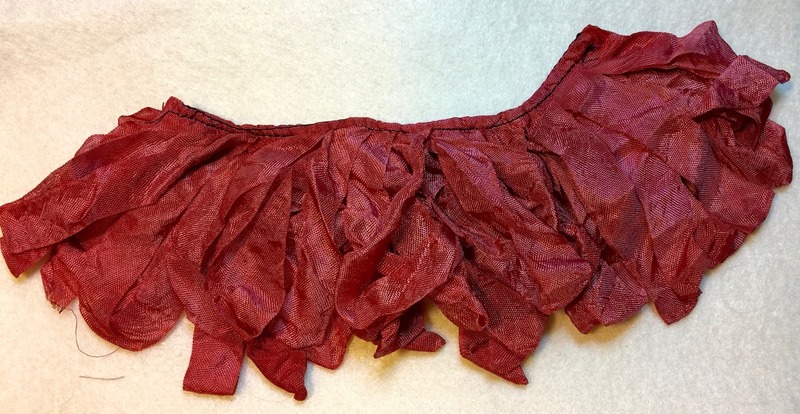 And, I avoided buying an expensive, $125 fringe making tool! 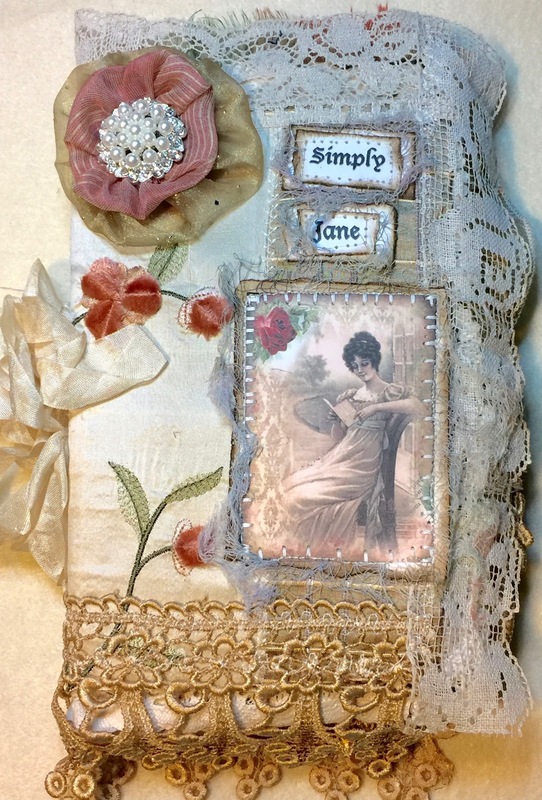 Here is my 'SIMPLY JANE' Mixed media collaged fabric journal. On sale in my Etsy shop HERE. You will absolutely LOVE, LOVE, LOVE this sweet Journal. Charming book measures 10"x6", with fabulous laces dripping out on all sides! 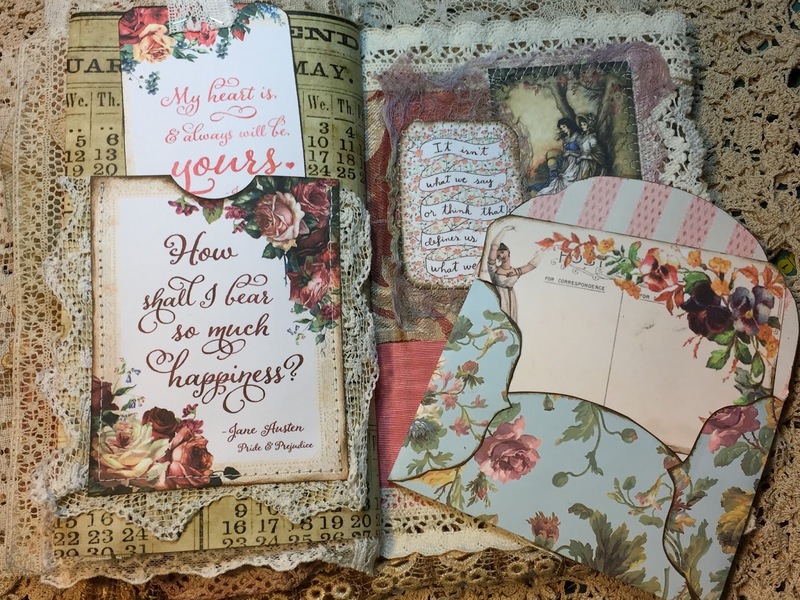 Every pages offers vintage graphics, many pockets, and many, many, journaling opportunities. 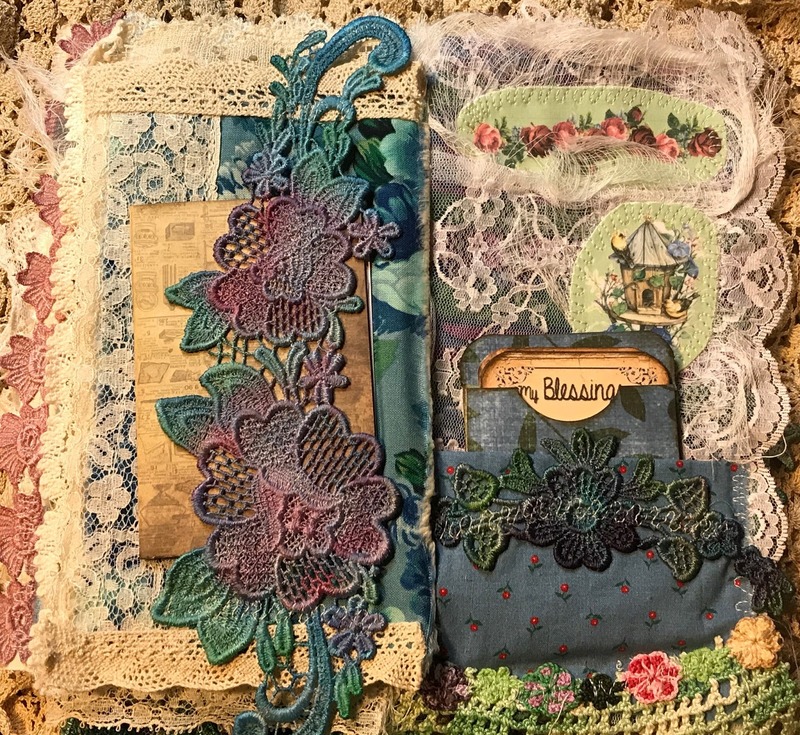 Note the sweet little envelopes (FOUR of them! ), designed by me, exclusively for this book. 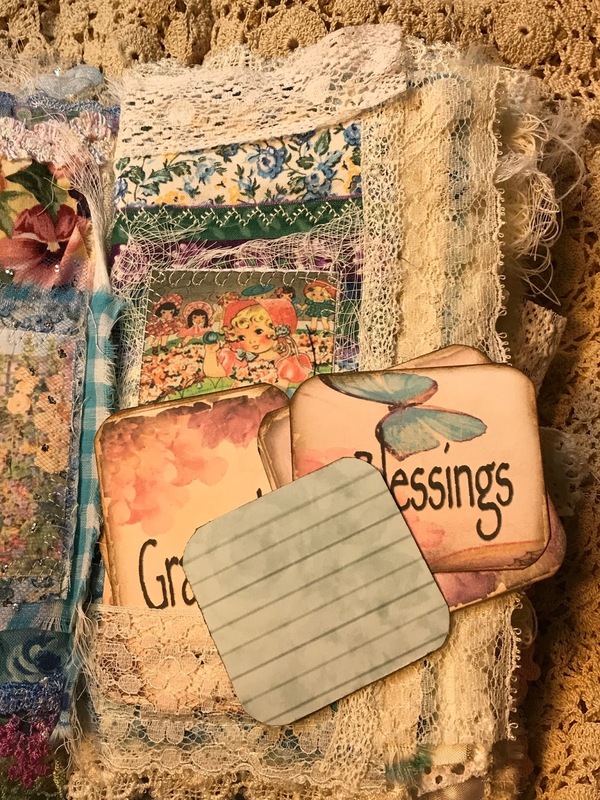 Lots of sweet tags will give you even more journaling possibilities. 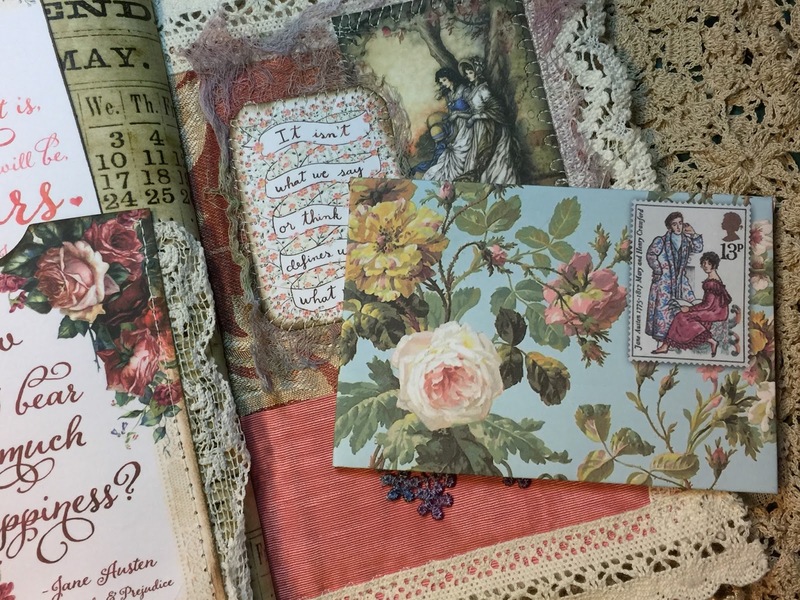 Each page hosts a decadent bundle of vintage trims, and even new designer trims. Handmade Blooms (flowers) and elegant bling, continue the opulence of the 'Austen' years. 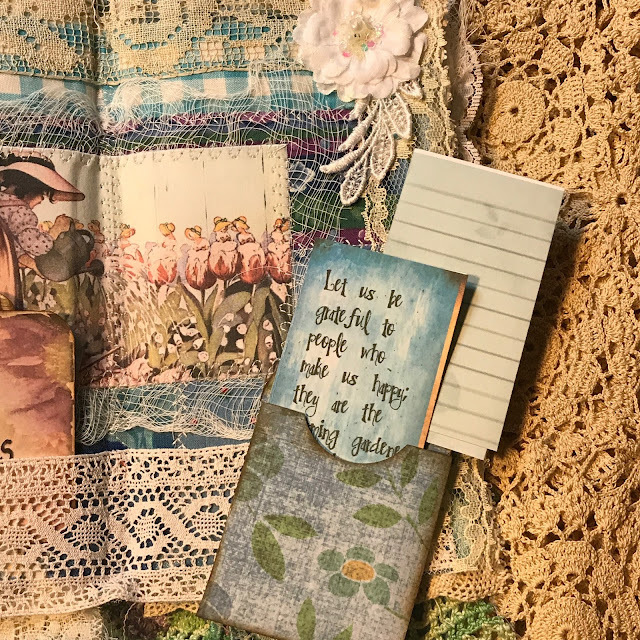 The many pockets will hold your thoughts and memories. 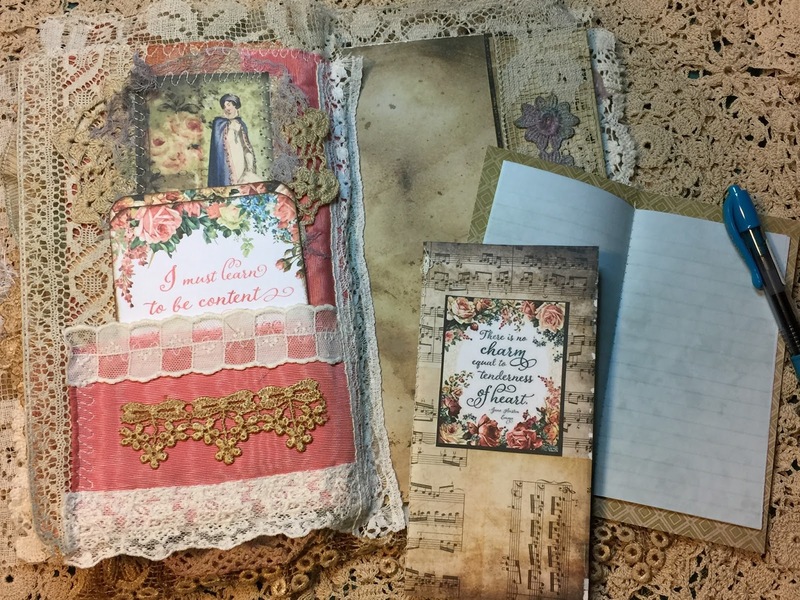 You'll be happy to find two removable mini journals! 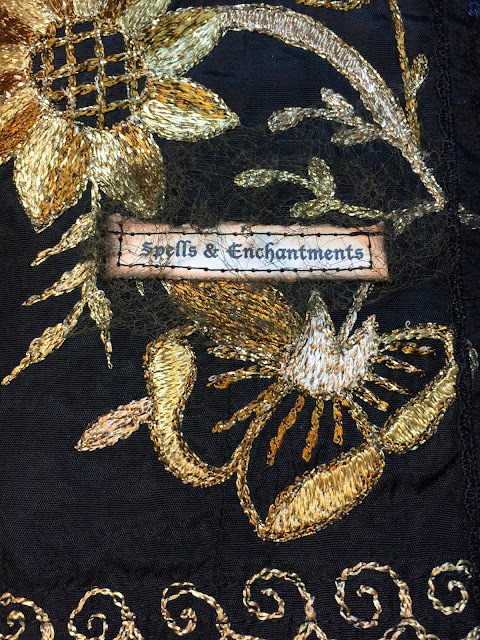 And, a silly little thing to top it all off...you'll find several 'embellished paperclips' attaching embellishments. 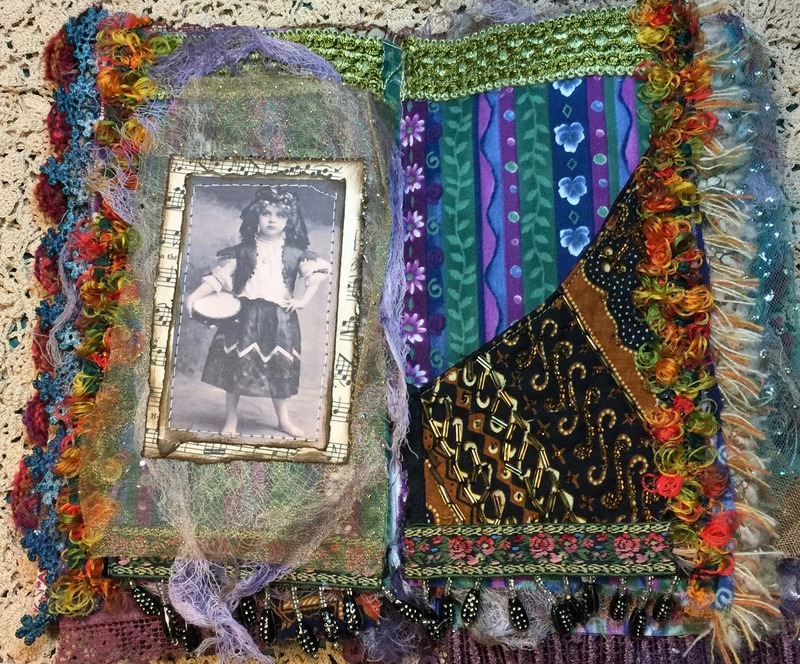 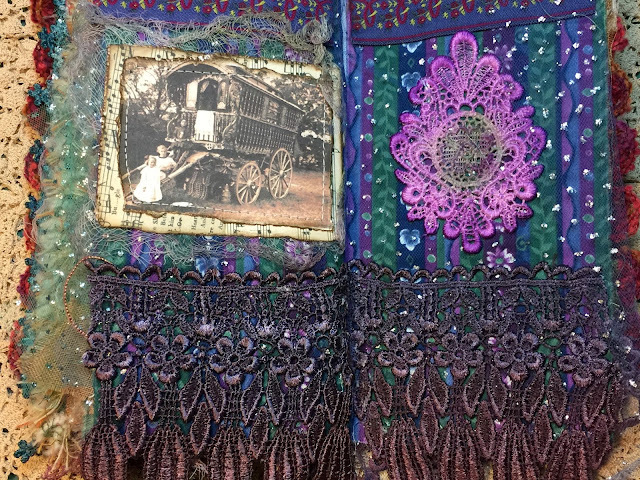 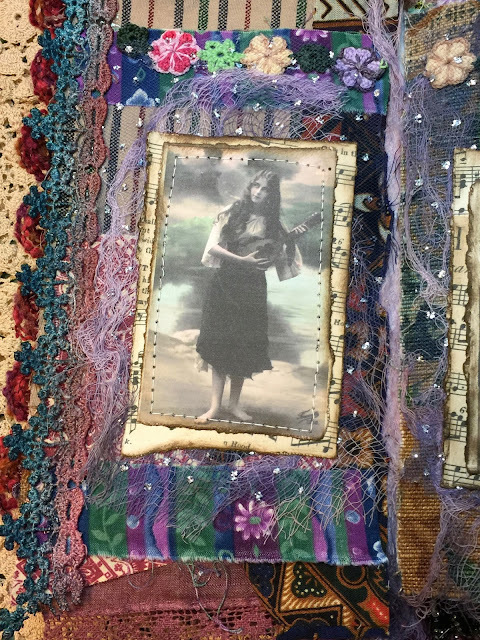 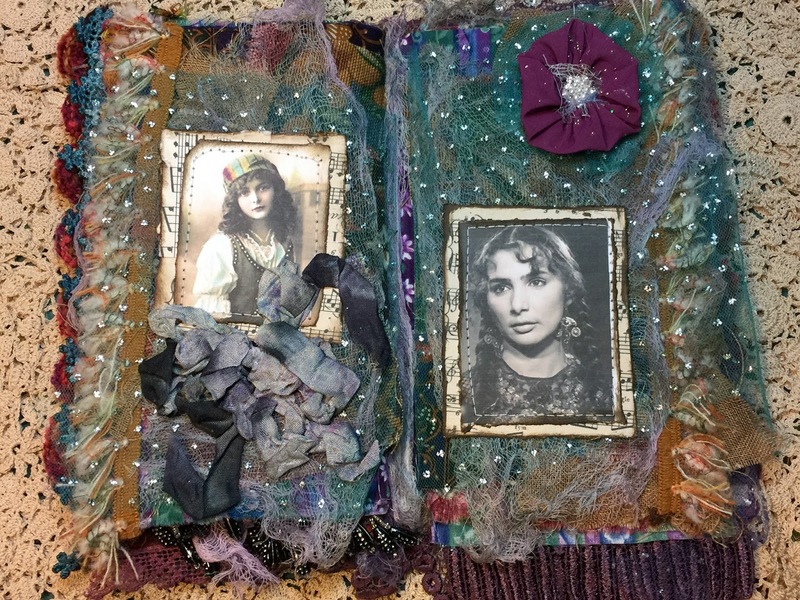 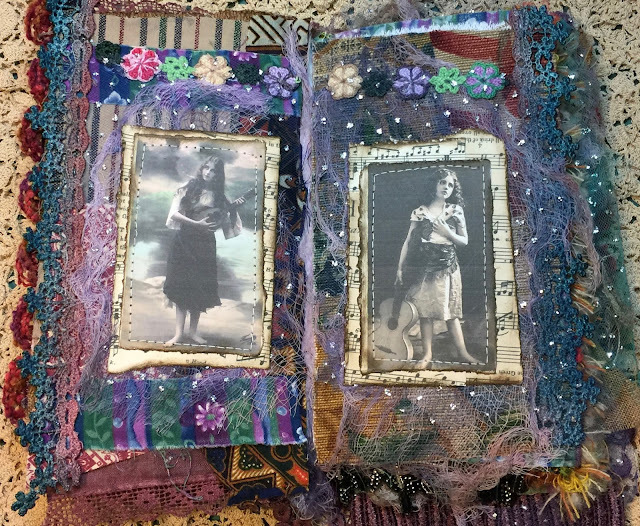 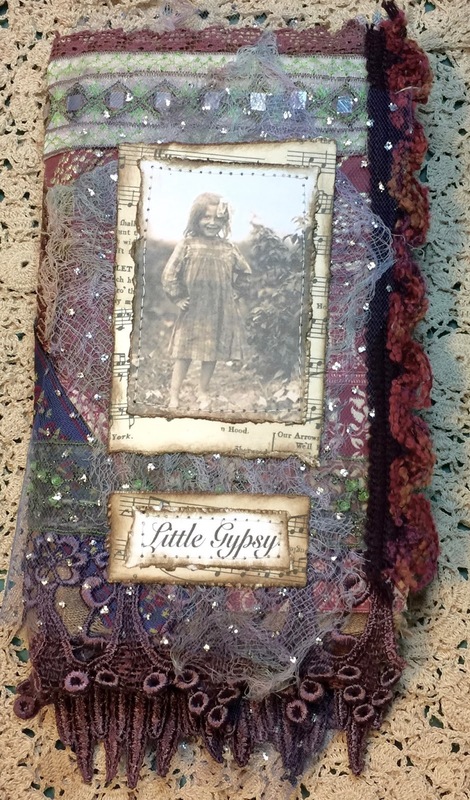 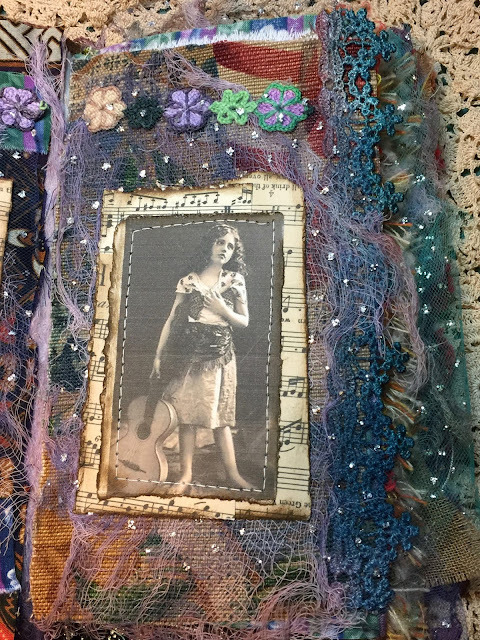 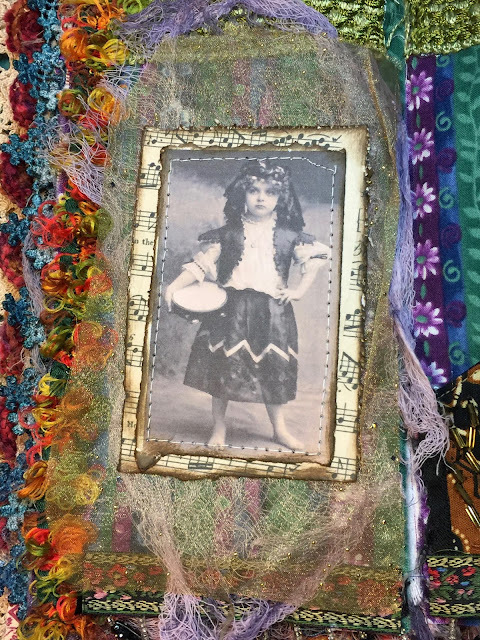 And here is 'LITTLE GYPSY' a fun mixed media collaged fabric journal. 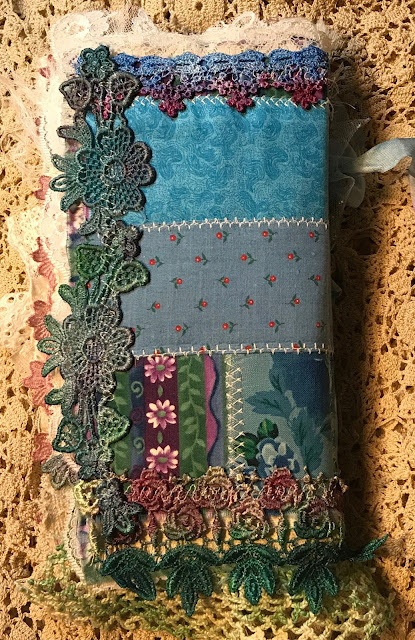 Also on sale in my Etsy Shop HERE. Well, it's almost Halloween, and that brings back memories of all the years my mom dressed me up with all of her scarves, necklaces, and outlandish clothes! I LOVED LOVED LOVED being a GYPSY even for just one day. 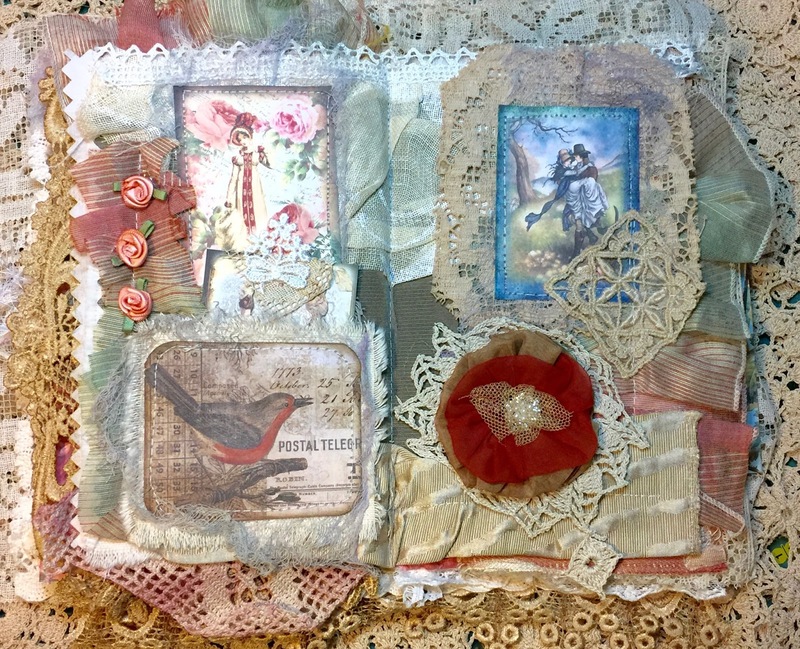 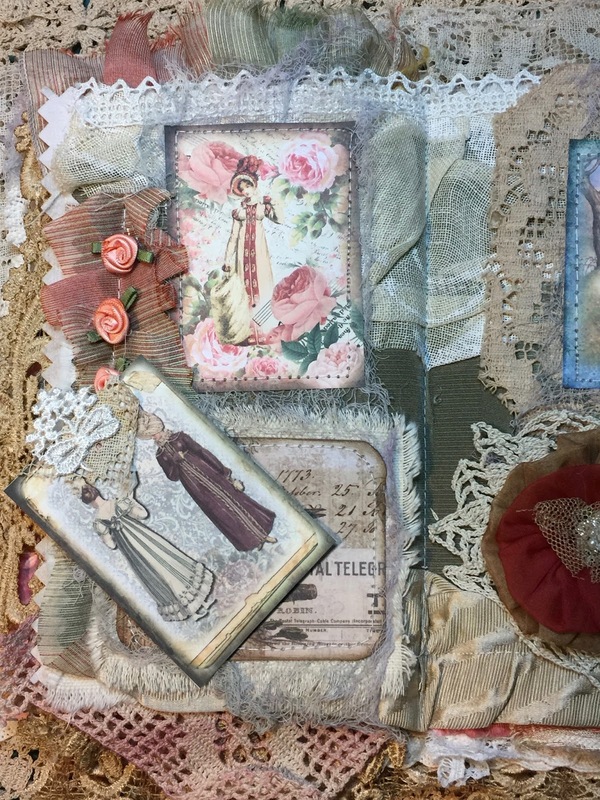 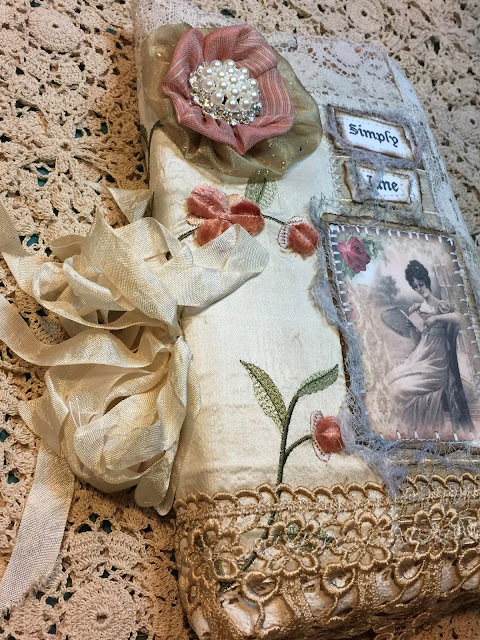 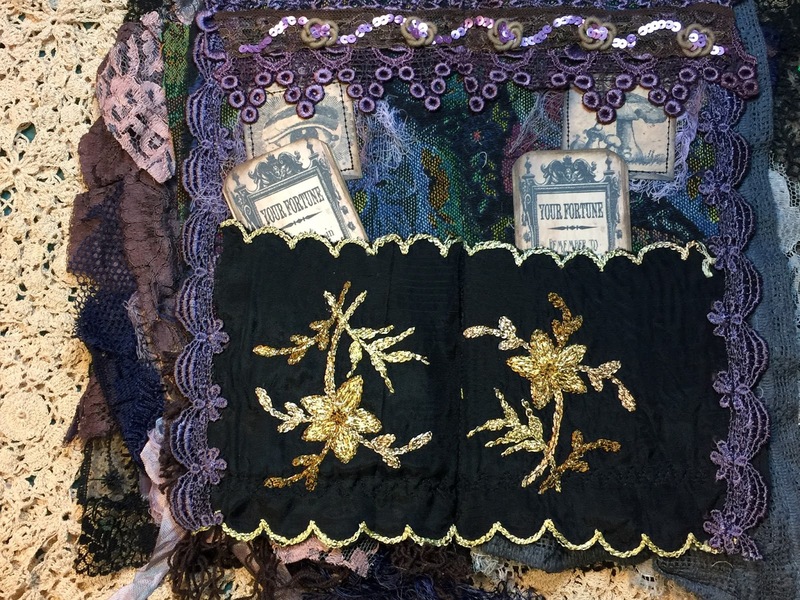 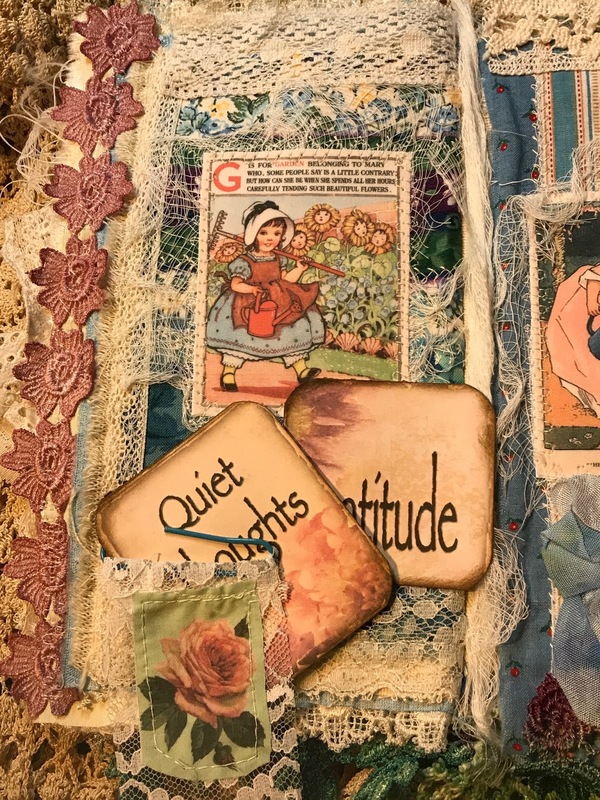 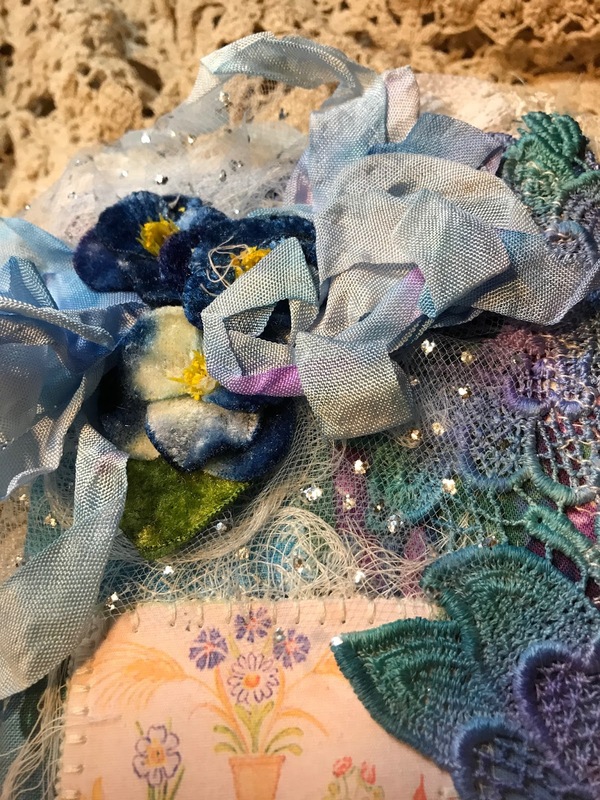 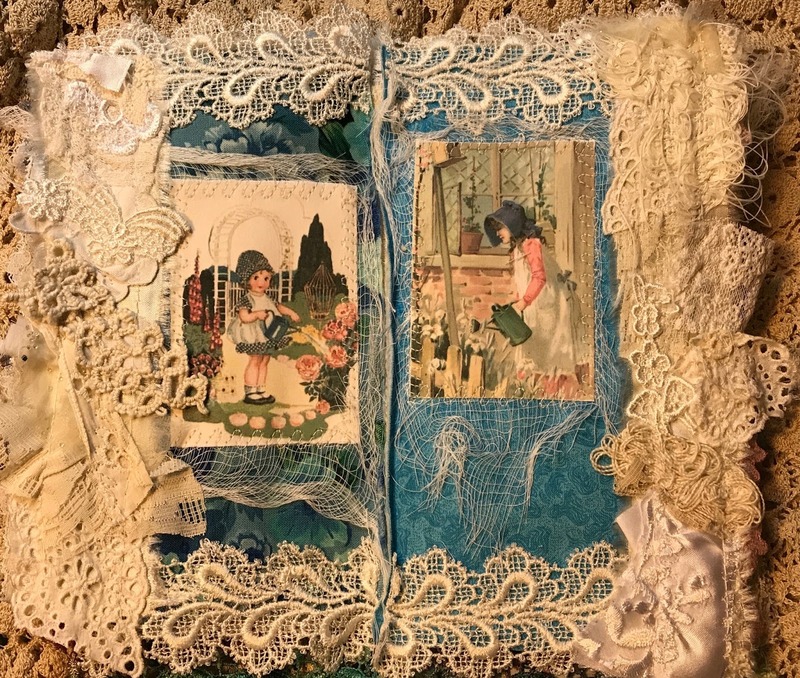 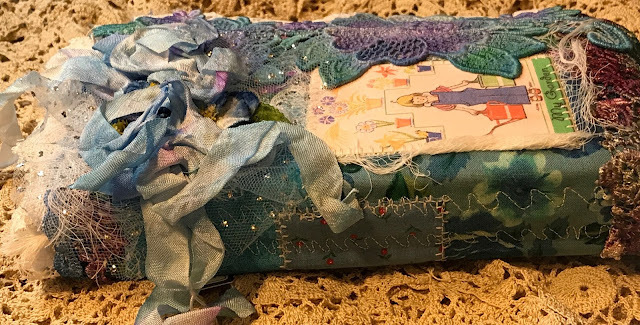 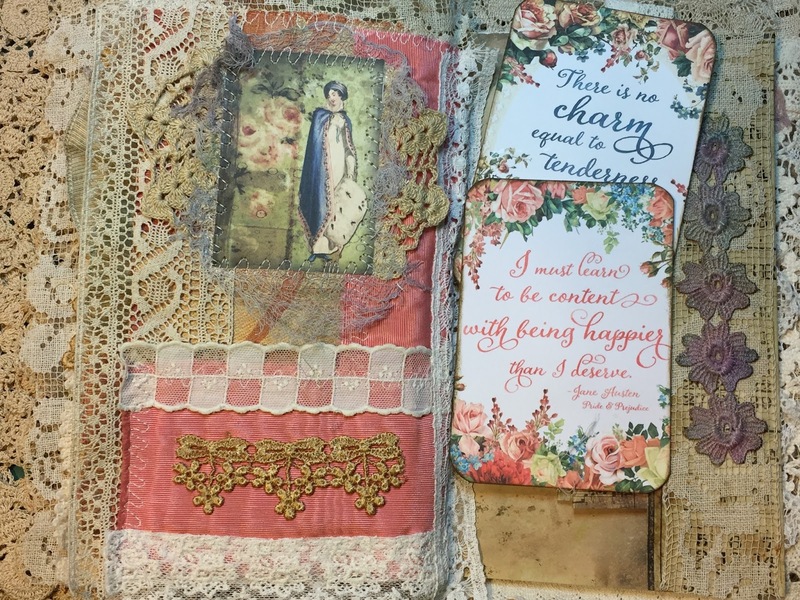 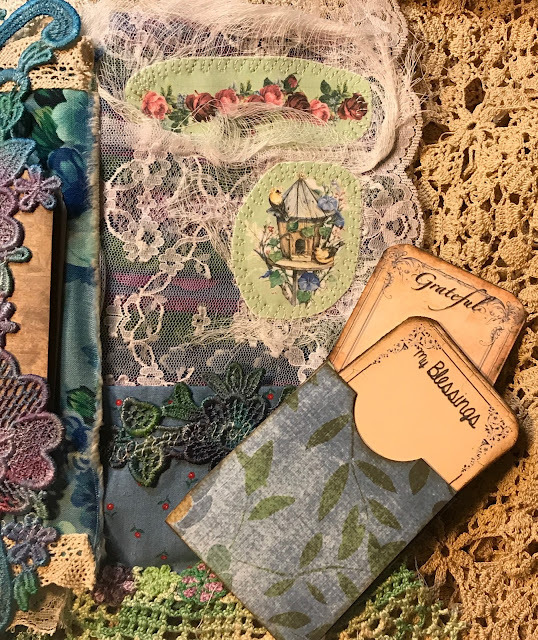 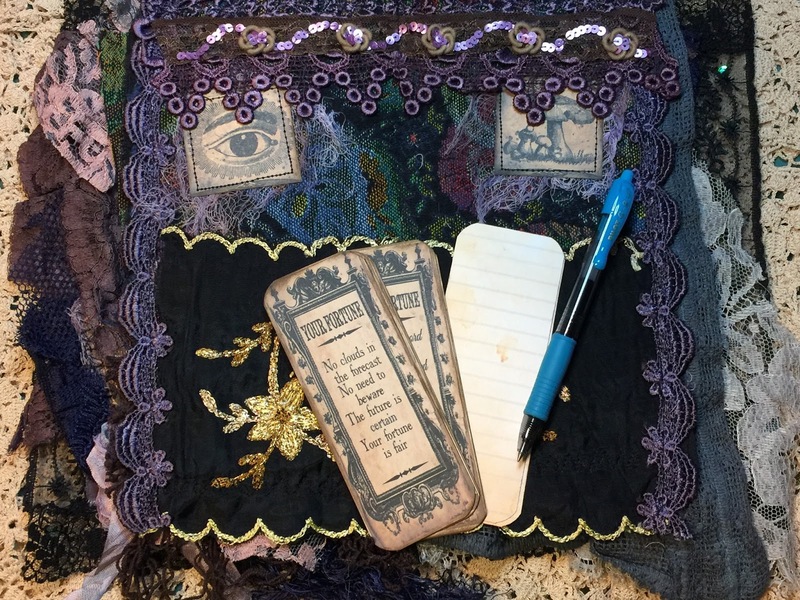 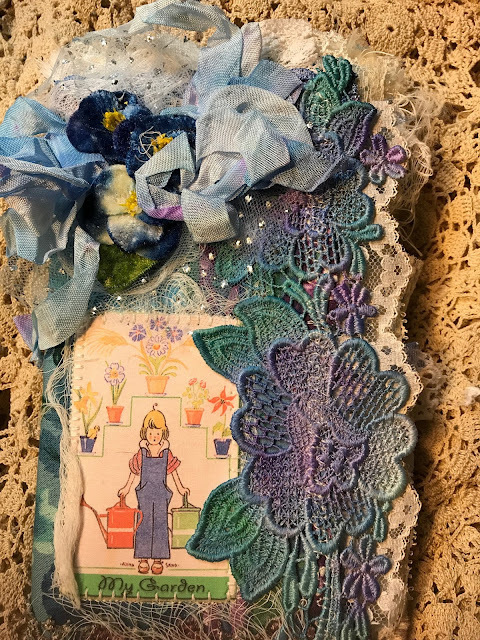 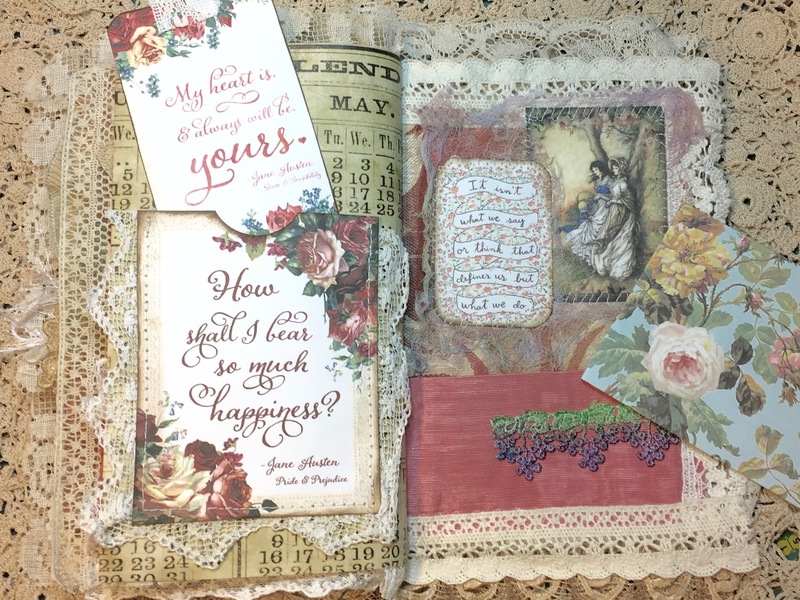 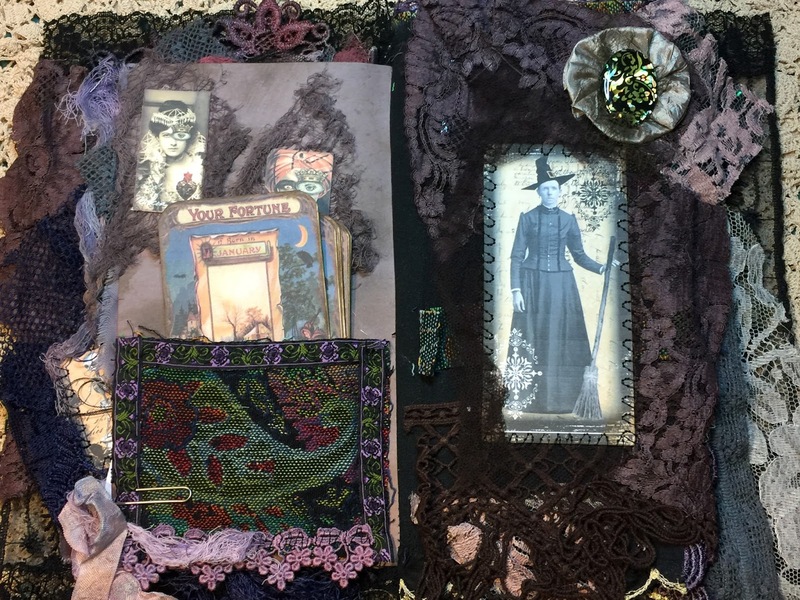 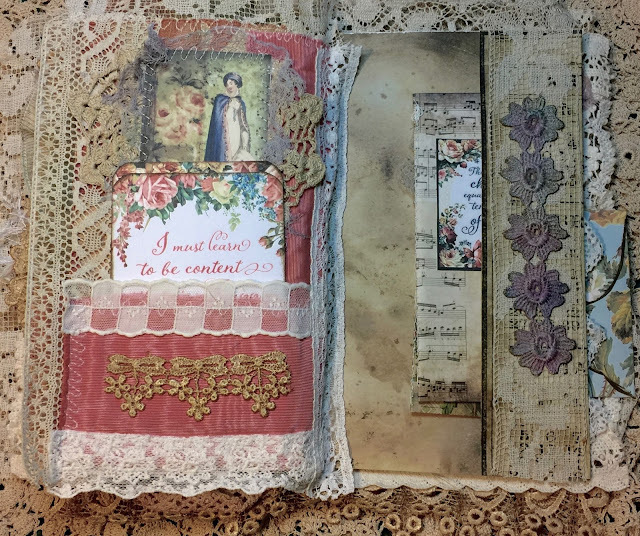 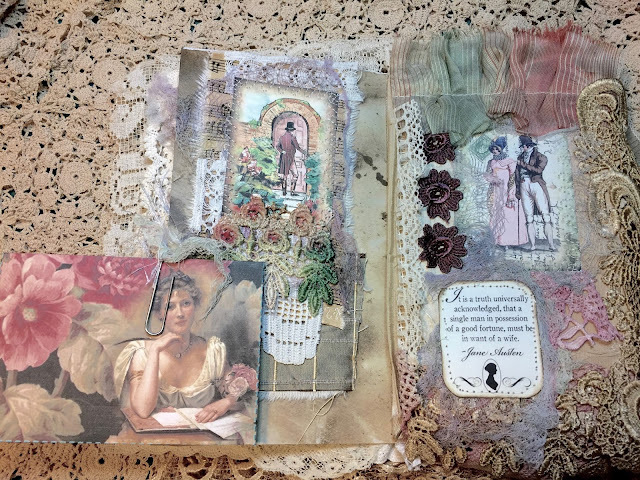 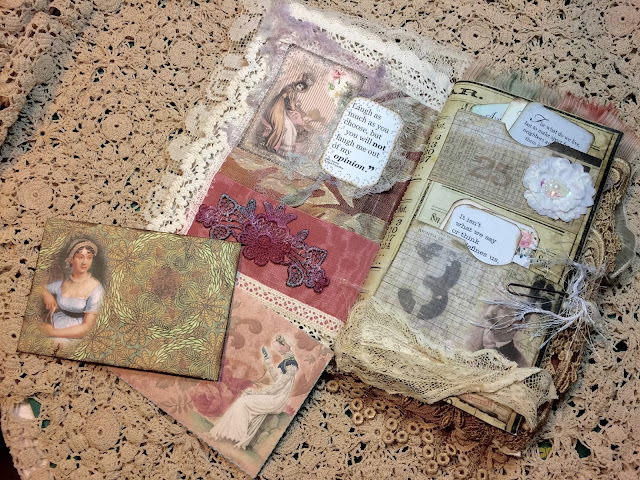 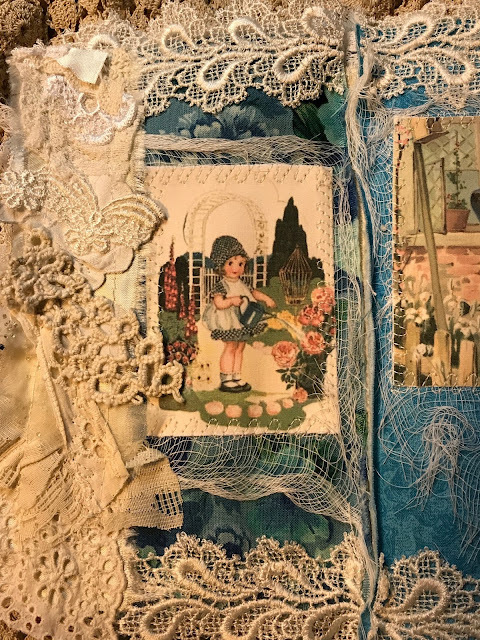 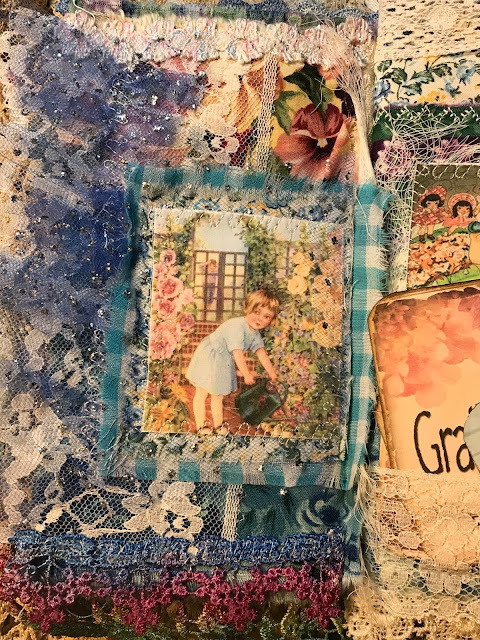 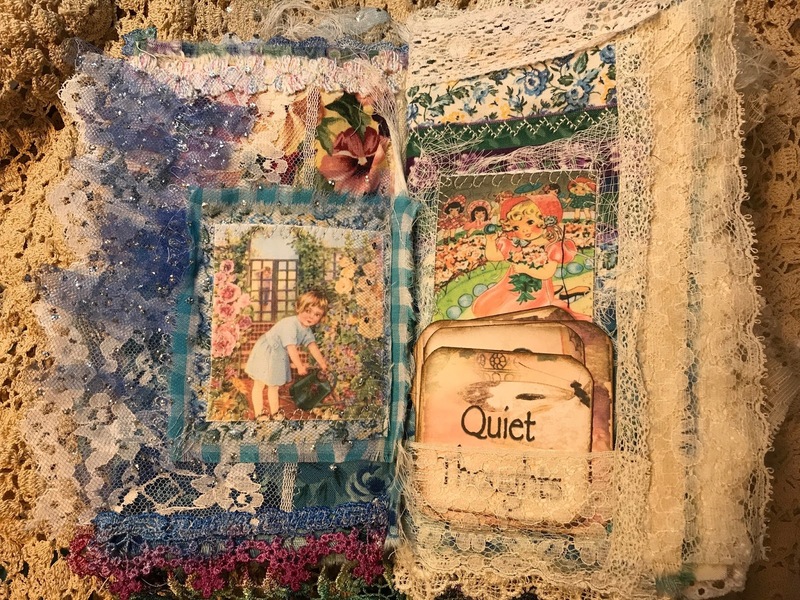 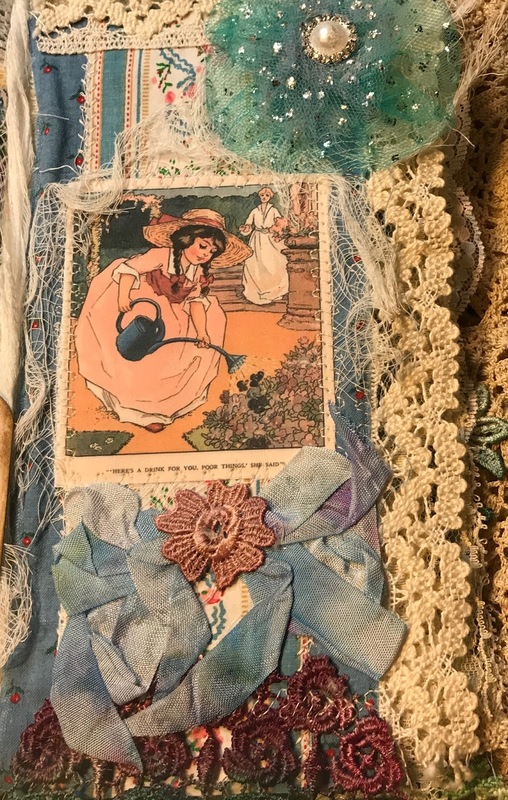 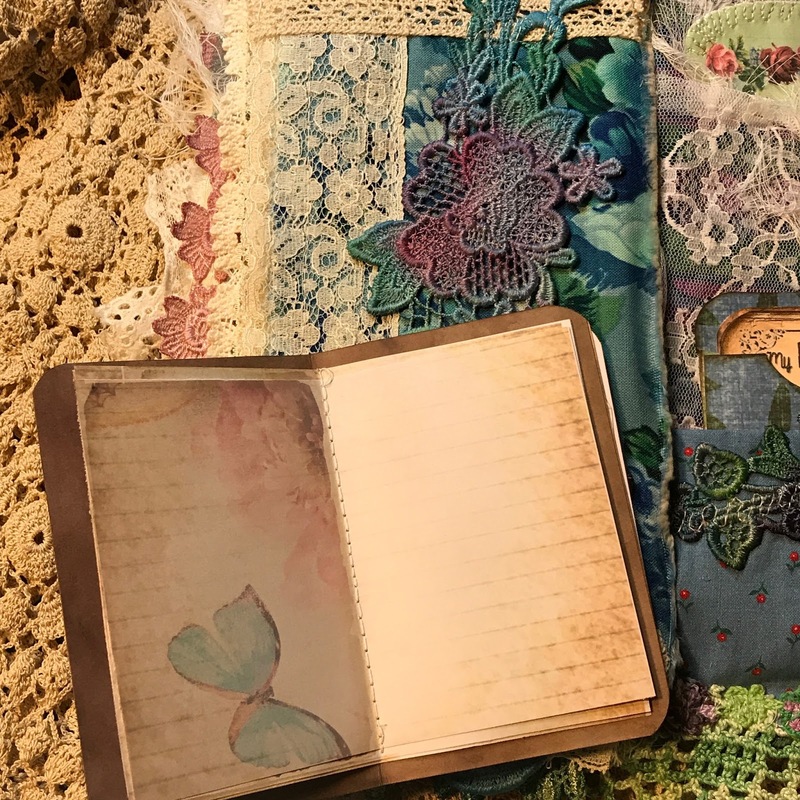 Each page is collaged, layer upon layer of vintage fabrics, trims, laces....and throughout, you'll notice some lovely, up-cycled designer trims and beads giving a beautiful bling to each page/collage. 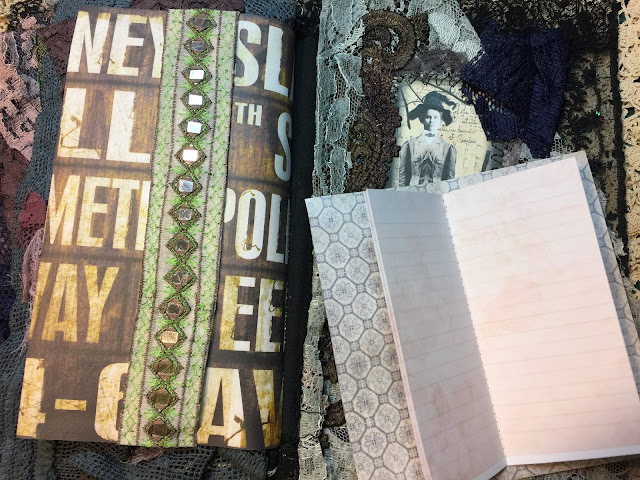 The last two pages have pockets in which you can tuck a sweet memory, picture, or treasure. 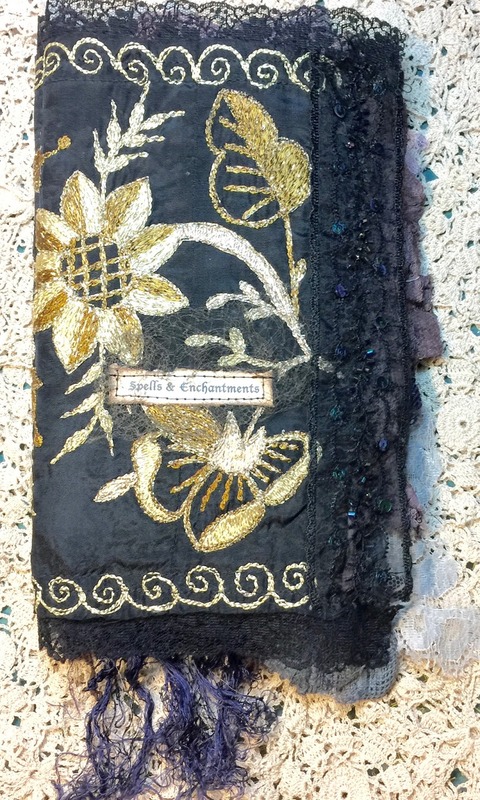 And who doesn't need a special 'SPELLS & ENCHANTMENT' mixed media fabric collage journal! 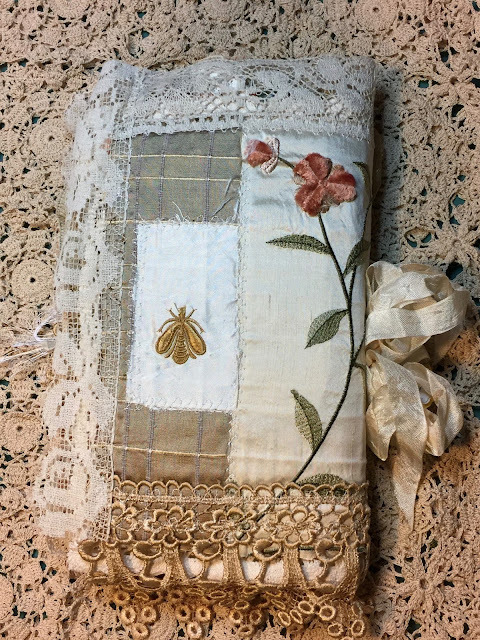 On sale in MY ETSY SHOP HERE. 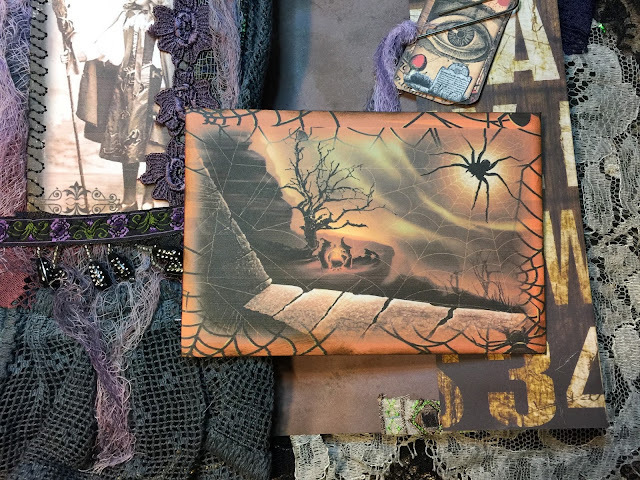 Halloween was always a special holiday in our family. My sister Jean used to go crazy decorating the front yard, garage (think spooky haunted house. She'd always outdo herself every year! So, it's my way of celebrating, to create a magical, mixed media collaged, book of spells and ENCHANTMENTS! 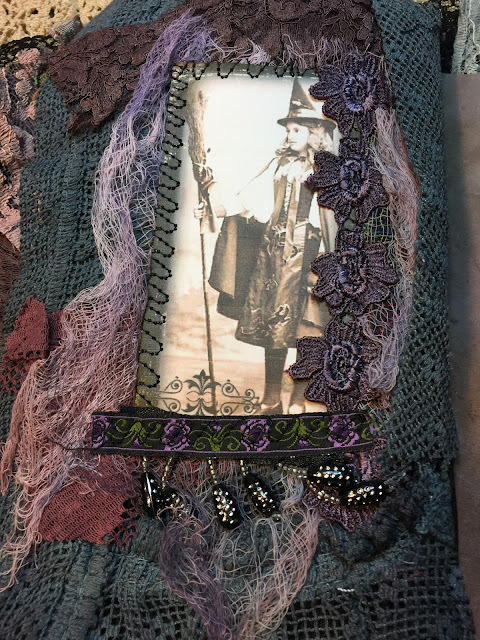 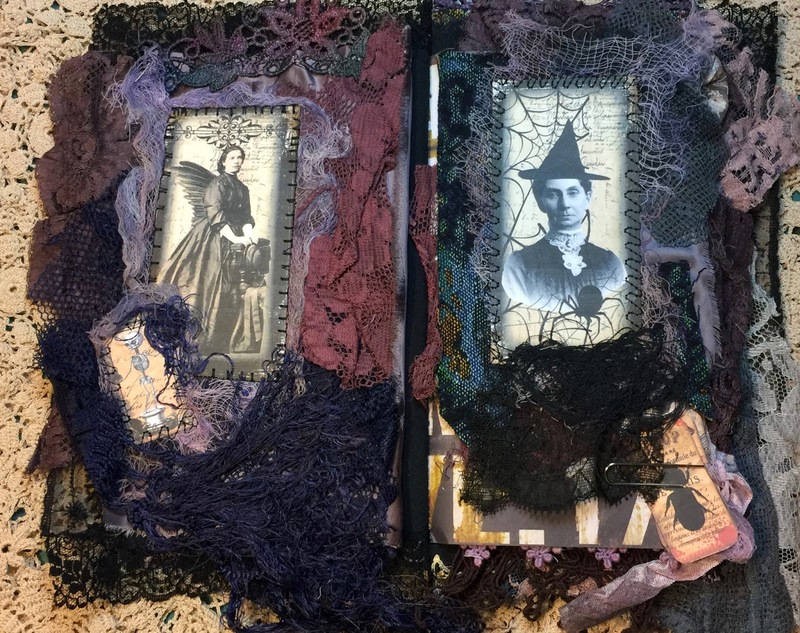 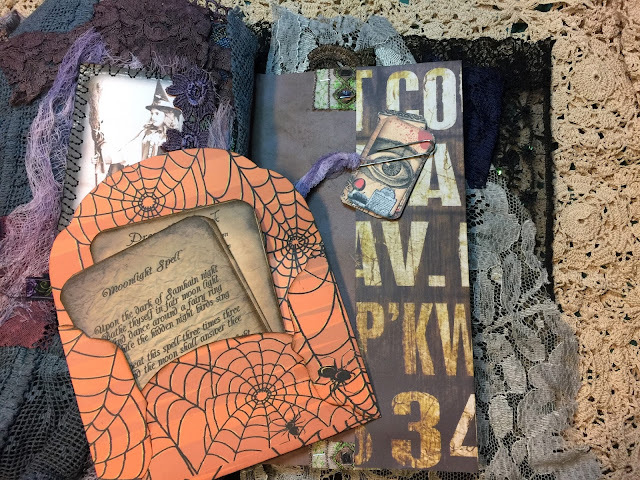 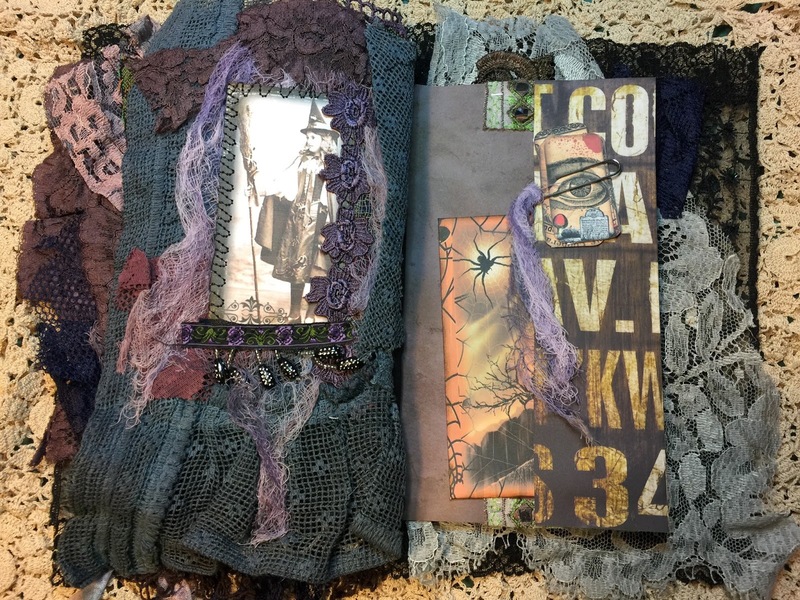 Measuring approximately 6"x10", with decadent laces flowing off each page, you'll find page after page of vintage halloween images, from witches to spiders! 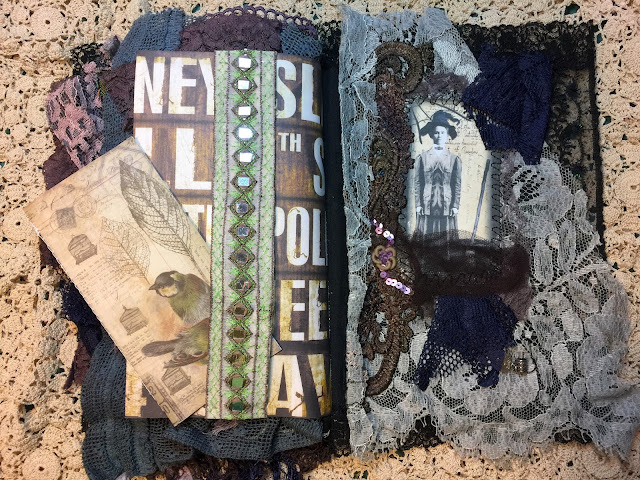 Several pockets to tuck in your 'Fortune' tags...each with a journaling opportunity on the back side! Several Halloween inspired, spooky envelopes will keep your secret thoughts. 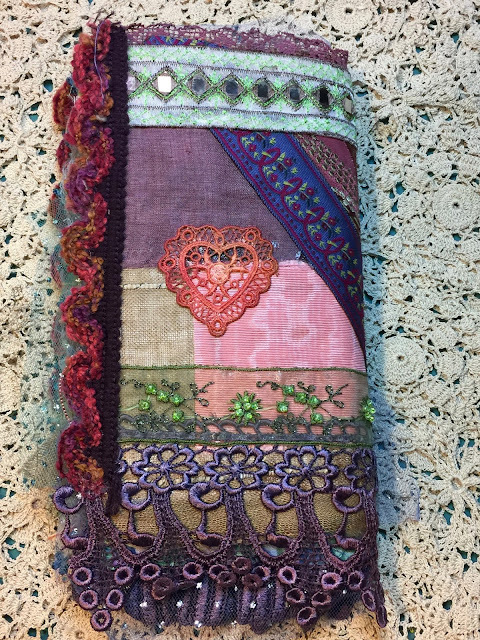 And a sweet mini-journal to boot!